This Waltons 6 x 8 shed has a wonderful skylight feature which helps makes the interior of the building light and airy, and a great place to work or even just potter around and relax for a while. The building is also fully UV protected, and is therefore less prone to wear and tear that may come from fading and cracking. 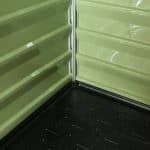 The unit has high strength polycarbonate cladding running throughout. 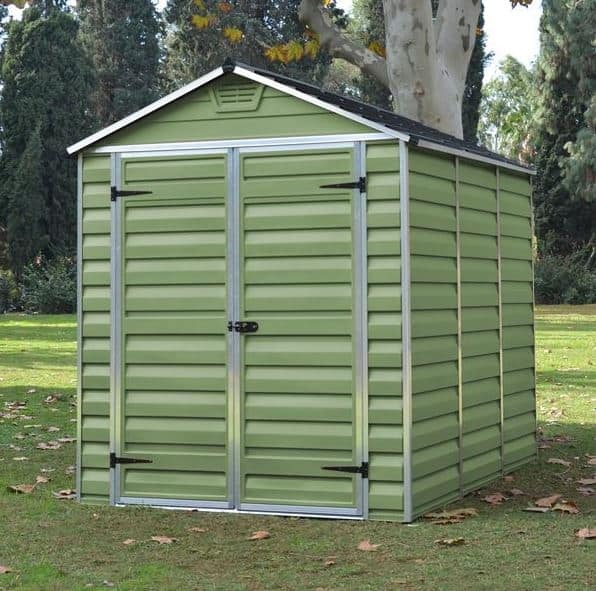 This provides you with a unit that is stronger and tougher than the majority of wooden sheds that are on the market. 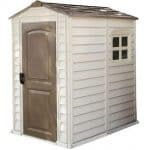 A floor is included as part of the package, and rounds out the value of this wonderful shed. To go along with those very impressive polycarbonate panels which make up the roof and the walls. A very solid, strong and also lightweight aluminium frame is used to keep this all together. This combination of polycarbonate panels and aluminium frame not only gives the shed a truly amazing modern look it also makes it one very durable and long lasting structure. 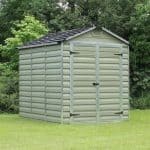 These materials will also make this the ideal shed for those of you who do not want to have to do a whole lot of maintenance. Actually these materials require no treatment or any kind of maintenance at all. 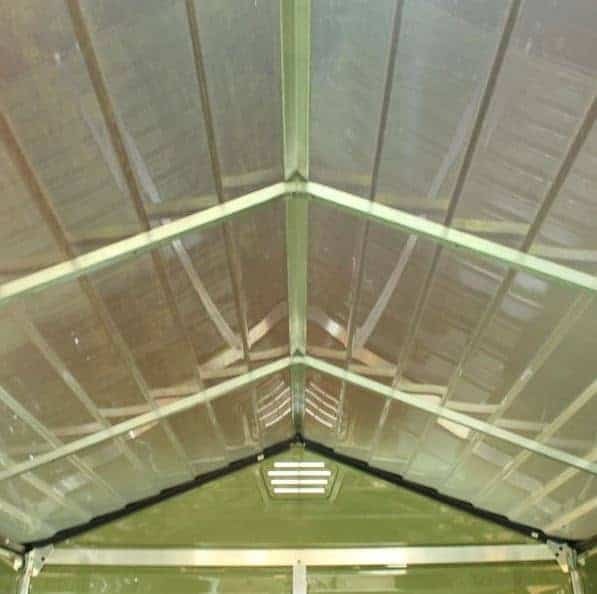 We are noticing that plastic based sheds are getting more and more popular and with ones such as this awesome, Waltons 6 x 8 Green Skylight Plastic Shed it’s very easy to see why. Sure this may not look as conventional as a shed made from wood, but we feel that, that’s a huge part of its charm. It really does have a fantastic almost workshop type of look to it. 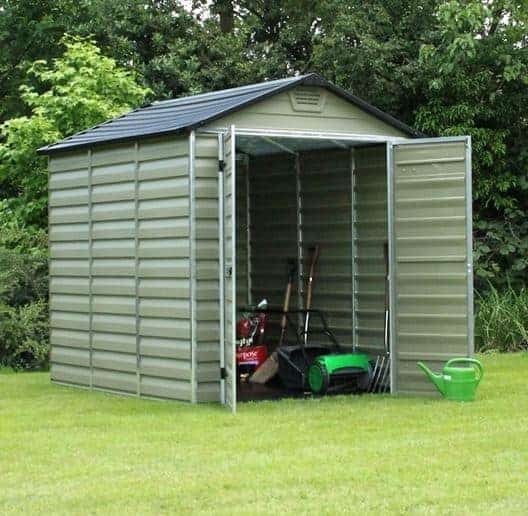 We feel that the design of this shed does give it a more modern type of look, but at the same time it is going to easily blend into any style of garden. 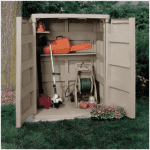 It is not the largest plastic shed we have seen, but with 7 feet 6 inches of depth and 6 feet 1 inch of width, you still have plenty of room inside the shed to store a multitude of items. One of the things we like about sheds like these is their headroom. No walking around hunched over like you are some kind of cave dweller. The 7 feet 1 inch of headroom along the ridge is very impressive and even at the eaves, you have 5 feet 6 inches of height. We just mentioned how the roof is high enough so that walking around is a comfortable experience, but actually all throughout this is one very impressively made roof. It is an apex roof so you do not have to worry about water sitting on top. The materials used for the wood are these amazing polycarbonate panels which are lightweight, waterproof and they somehow allow natural light into the shed, but you cannot see through them. They also have this great look which makes them look like they are made from slate. The walls of the shed are made from polycarbonate panels like the roof. These walls are just incredible. 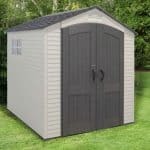 They have a very attractive look to them which we feel makes this shed have a very different kind of style than you get with a wooden shed. These panels are not just easy on the eyes they are also very practical. They are weather resistant and will stop the rain dead in its tracks when it tries to get in here and wreck your stuff. If you are worried about the colours fading over time then do not as these panels are resistant to ultraviolet light. So the sun can blast down on it for years and not fade the colours. 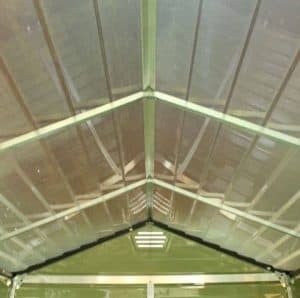 The polycarbonate panels that make up the wall are far more durable than you would think, but they do have some very heavy duty back up in the form of the impressively strong aluminium frame that sits inside the shed keeping all together and making sure this is is a structure that is very robust. This frame really does keep this shed secure and it is able to take a bit of abuse over the years. 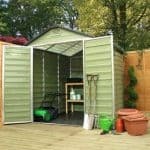 We have seen many plastic sheds where you either have to sort out the flooring yourself or have to build it on a concrete base. Well this one is actually giving you a free floor with it which is great. This is a strong flooring which literally can be placed anywhere so if you only have grass in your garden then you can place this directly onto it without the worry the grass and the damp is going to destroy the bottom of the shed. This flooring also can be anchored down to the ground if you want to give it a bit of extra stability. While we love wooden sheds we do know that some people are not into the whole, treat it once a year thing that comes with most of them. 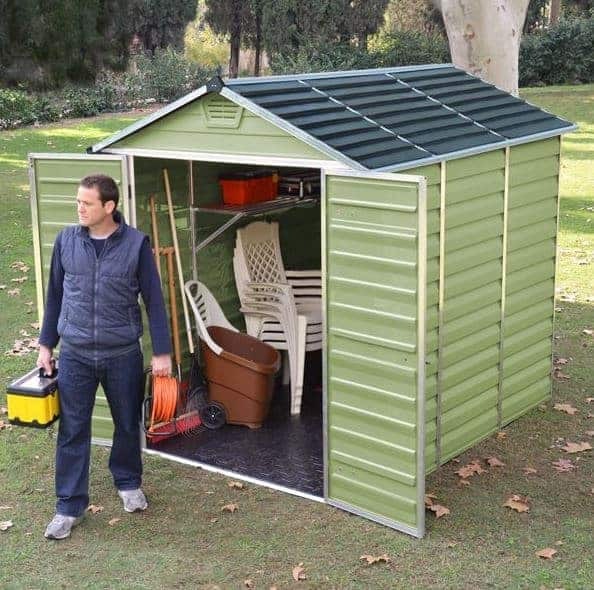 If this sounds like you then you are going to love how low maintenance this shed is. The materials used here require no TLC at all at most you might want to give it a wipe down with a sponge to keep it clean. You are getting a ten year guarantee with this shed which is something we always like to see. To be honest with you the materials used here are so long lasting, we can see you getting well over 20 years with this shed. Still having a nice, lengthy guarantee watching your back is always a good thing. 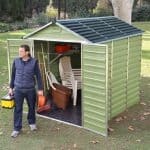 The Waltons 6 x 8 Green Skylight Plastic Shed has a set of large double doors which will make getting those larger items inside easy. It also makes it easy to get into the shed when you have not done something you were supposed to do and need a place to run and hide from your other half. This door when both the doors are open gives you 5 feet 7 inches of height and 4 feet 2 inches of width. This is one of the larger doors we have seen on any style of shed and that is something we really like about it. No twisting and turning your mower like you have to do with a single door. This shed does not have any windows which is something that would normally make us raise our eyebrows or at the very least scrunch our noses up a little bit, but actually as the roof acts as a skylight, you really do not miss the windows at all as natural light still gets into the shed. A high quality pad bolt is included so you are going to be able to make sure those double doors stay securely closed. You could easily add a padlock to this which if you have some expensive items stored inside of here. With there being no windows on the shed unless you have the doors wide open there is actually no way for people to look into the shed so it is one of the most private sheds you can get. There is no way to change the look of the shed due to the materials used. However we feel that this adds to the no nonsense, hassle free kind of style this shed has as you just buy it and do not have to worry about tinkering with it at all. No extras are offered with this shed as they are simply not needed. A padlock is pretty much the only thing you have consider purchasing. When you hear the term, plastic shed you might not think the quality is going to be all that high, but actually from the floor to that amazing, skylight roof this is a shed that is high quality all the way through. You are going to get many years of use out of this shed thanks to those long lasting materials which have been used. This is one of the smaller sheds in this line, but for a more compact gardens we feel this is going to be a good size. The polycarbonate panels will slot and join together relatively easy and cause you no headaches. Just be sure to have a friend help you out as the roof can be a little tricky due to the height. We feel that most people will take 4-6 hours to install this depending on their DIY skill level. 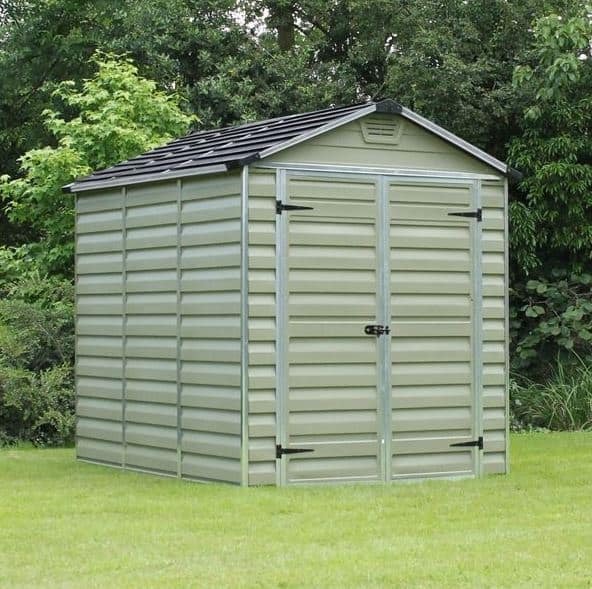 This is one very well made shed and we feel that the price is fair considering the material used and how long it is going to last you. Final Thoughts: The Waltons 6 x 8 Green Skylight Plastic Shed is one very well made and great looking shed that we feel would fit in well with any type of garden. 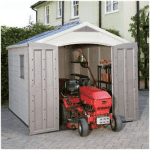 The combination of polycarbonate panels and that aluminium frame is going to ensure you get many years of use out of this shed and also that you will not really have to lift a finger to look after it. The shed may be a little small for some, but as long as you think about the way you are organising things and if you make sure to take advantage of the height then you will find you can fit a whole lot of items inside of here. 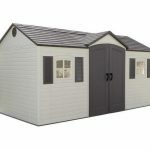 If a low maintenance, easy to build kind of shed is what you are after then this is one that is well worth considering.